April 2019: Stickers temporarily out of stock, will return soon! 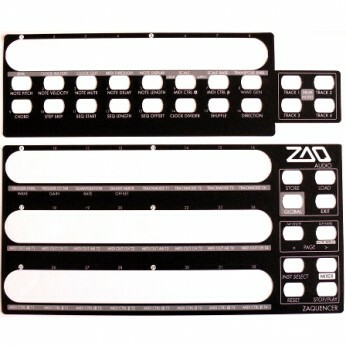 The Zaquencer Overlay is a high quality plastic, machine-cut-out sticker of the control layout for the Zaquencer Firmware. It consists of two parts, one for the top and one for the bottom of the BCR2000. The layout file itself is also part of the Zaquencer Firmware bundle, so you could also print it and cut it out yourself. This sticker is an additional accessory for someone who wants to style the surface of the BCR2000 in a more professional and permanent way. To ensure best performance, please make sure before applying the sticker that the BCR is free of dust and fat (fingerprints etc). The glue on the back of the sticker develops it´s maximum strenght after a few hours so the overlay can be reseated to some extent during initial placement.